In a medium bowl, whisk together vinegar and sugar. 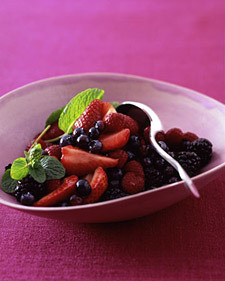 Add strawberries, blueberries, raspberries, blackberries, and mint. Toss to combine. Transfer to serving bowls and sprinkle nuts over top if desired. Add less ingredients if you wish to make 1 serving.